Housing Works turns circa-1940s Prineville building on six acres into community hub. 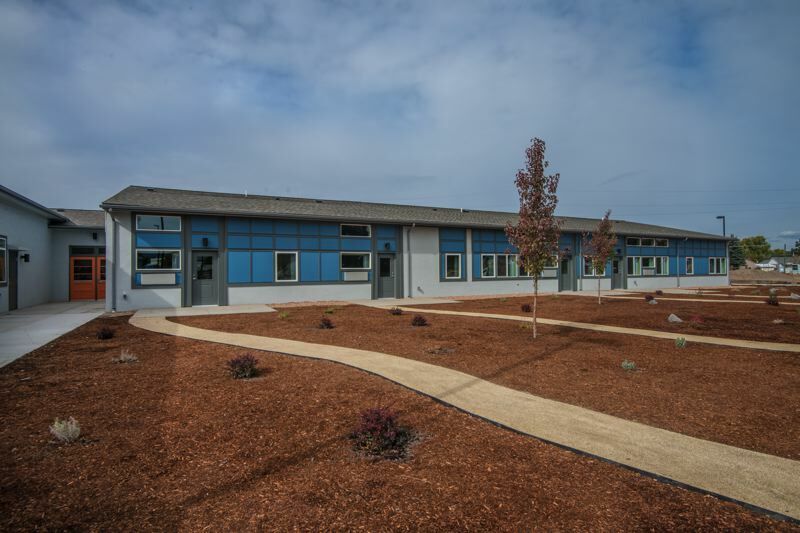 A 70-year-old building at the entrance of the city of Prineville may have outlived its usefulness as a school, but for an area housing agency, the former home of Ochoco Elementary School has provided an A-plus opportunity to create much-needed affordable housing. Housing Works, which serves as the regional housing authority for three counties in Central Oregon, didn't stop with housing for low-income families, though. The agency also turned the six acres on which the school sits into a community hub complete with park space, a community garden and space for a pre-school program. Keith Wooden, real estate and facilities director for Housing Works, views the development, which has been named Ochoco School Crossing, as one of the most innovative projects he's been involved in. "It's not just Ochoco Elementary School anymore," Wooden said. "It's a campus with city connections. You can't afford to build all of this stuff on a new construction project." 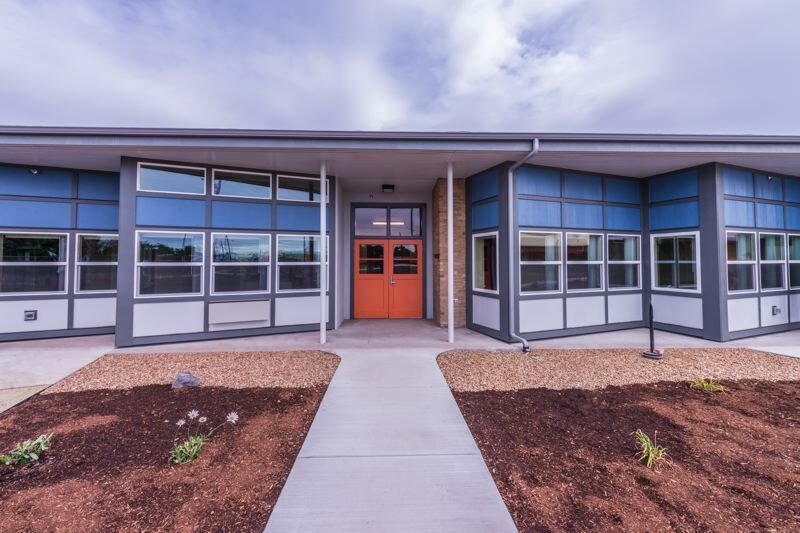 The main feature of Ochoco School Crossing was an effort by Wooden's agency, Bend-based Pinnacle Architecture and R&H Construction, which has offices in Portland and Bend, to transform classrooms in the one-story former school building into 29 affordable apartment units. 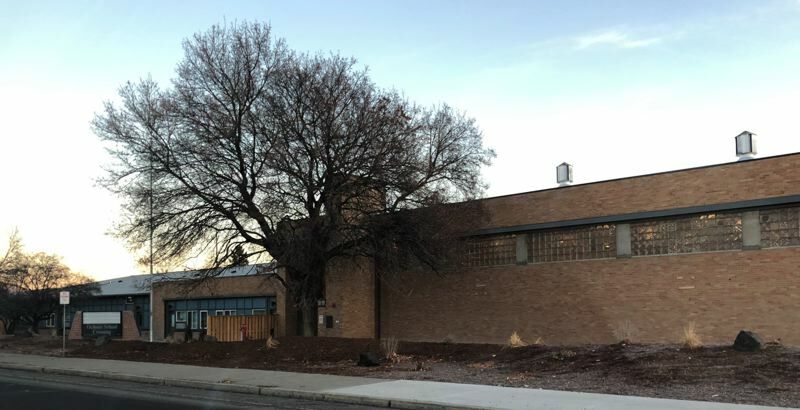 Crook County School District had used the building since the 1940s, but over the years, the building had become outdated. The location of doors to the outside posed security risks based on modern-day standards. The building's design didn't conform easily to current trends for flexible education space. With an eye toward consolidating three existing schools into two, the school district won voter approval of a $33.5 million construction bond in 2013 that was used to build a new school. The Ochoco School was placed on the market. The features that made the building ill-fitted for a 21st-century school, turned out to be assets in the eyes of Housing Works' leadership team. 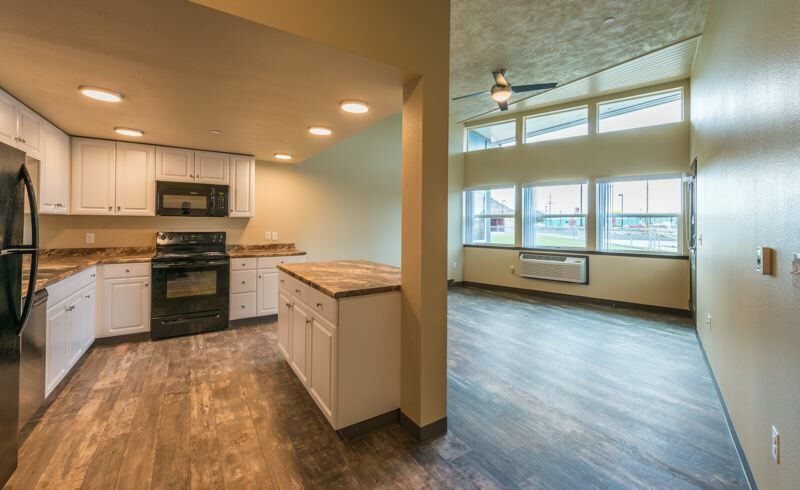 The agency's services for Jefferson, Deschutes and Crook counties include a development arm that handles construction of new affordable housing units. The development division also tackles renovations of existing buildings when it comes across structures that have potential to be transformed into affordable apartments, according to Wooden. The Ochoco School building, for example, featured high ceilings. Classrooms were perfect sizes for apartment units, which reduced the number of interior walls that had to be moved. The school district also had updated the water system four years before Wooden's group bought the building. Best of all, the building was structurally solid. "The bones were great," Gary North, R&H vice president who leads the company's Central Oregon operations, said. The team ran into some surprises that went beyond replacing windows and ceiling tiles. Because of its age, some of the materials in the building contained asbestos, which had to be carefully removed. "We had a pretty significant ... abatement effort even before we could get employees in there safely to work," North said. Some unreinforced clay-unit brick walls couldn't be moved, which meant workers had to focus on modifying them. Because they were very fragile due to age, workers had to be careful they didn't degrade them while working on them. The walls were seismically reinforced to meet current standards by putting new walls on either side and then attaching the new and old walls together with clips. "We (also) had egress issues to deal with, fire issues to deal with," North said. "Those are common to all environments, but adapting an existing building to new use, those can be more challenge than in a new building. When Housing Works purchased the school, the $600,000 deal included two portable classrooms and a separate cafeteria building that sat on the six-acre property. The housing agency set about putting those auxiliary buildings and land to good use. The cafeteria building's roomy kitchen made it the perfect location for a local Headstart program that needed a new home. Although one of the portable structures proved to be unusable, the other became the home of a youth building program run by the Oregon Department of Labor. Meanwhile, some of the unused land is being turned into a garden to benefit an area food bank. The rest, which includes an existing playground, is being leased for $1 per year by Crook County Parks and Recreation Department, which plans to use it as a public park. The project started in August 2017 and finished one year later. Even before R&H released the completed project to Urban Housing, 160 people had applied for the apartments, Wooden said. One week after the agency opened up the property, tenants had moved into all of the units. Filling its units quickly once it opens a development isn't unusual in Prineville or any of the other Central Oregon communities where Housing Works offers low-income housing, according to Wooden. The city of approximately 10,000 people has experienced a boom in population growth that shows no sign of slowing yet. That has put a squeeze on housing available, which in turn has driven up prices. "(Facebook and Apple])have been building massive data centers. They're bringing in all of this outside workforce, and there's nowhere to stay," Wooden said. "They been doing that for years, and there's still five or 10 more years to go. The city also sees people who work in the hospitality industry in Bend, where housing prices have skyrocketed, turning to Prineville and other small communities within a 30- or 40-minute drive of the larger city in search of rental units they can afford. "There's housing pressure from all over the place," Wooden said. projects also are under construction or coming on line soon in Redmond, LaPine and Madras. "We don't get a ton of people from outside the area moving into our units," Wooden said. "We keep our marketing local. We know there's a need." But even as the housing authority works to help fill the demand for affordable housing, there's another sector of the Prineville — and Central Oregon — housing market that's still feeling the pinch. "There's this pressure not only for what we do, but real pressure for the middle market," Wooden said. "The missing middle, families with good jobs. They're spending half their paycheck for a rental."